Edmunds, Cox Auomotive and LMC forecast U.S. light-vehicle sales will rebound in 2018 over 2017, driven by higher fleet deliveries and stronger than expected retail volume in the final months. LMC sees 2018 industry sales finishing 60,000 units above 2017 levels, marking the fourth straight year volume has topped 17 million units. U.S. light-vehicle sales are expected to finish the year up slightly from 2017, defying forecasts that almost unanimously called for the industry to post a second consecutive annual decline. Higher fleet deliveries, low unemployment, U.S. tax reform and Tesla's rapid production ramp-up are among the reasons that sales likely increased in the face of lower retail volume and rising interest rates and vehicle prices, analysts say. December is on pace to be the second-strongest month of 2018, with sales of about 1.6 million vehicles pushing the year's total volume to nearly 17.3 million, according to forecasts issued this week by J.D. Power/LMC Automotive, Cox Automotive and Edmunds. Automakers sold 17.24 million vehicles in 2017 -- the fourth-best year on record, pending this month's results. Going into 2018, few experts anticipated that sales would top 17 million units for a fourth consecutive year. But only in July and August did the industry's seasonally adjusted, annualized selling rate dip below that level. "There is no denying 2018 was a very good year for the U.S. auto industry," Cox's senior economist, Charlie Chesbrough, said in a statement. "A SAAR above 17 million signals a very strong market. Many economic factors pointed to a slowdown in the second half of the year, but sales remained in high gear, and it looks like they will finish that way as well." The latest forecasts call for December sales to be off no more than 0.6 percent from a year ago, with a SAAR of 17.3 million to 17.4 million. That compares to the December 2017 SAAR of 17.44 million. Edmunds is projecting December sales will edge up 0.3 percent in part behind year-end and holiday promotions. Retail sales likely will be down about 1 percent in December and for all of 2018, according to the J.D. Power/LMC forecast. That's in part because automakers have pulled back a bit on incentives to avoid eroding strong profits. Incentive spending in December has declined 3.8 percent from a year ago, J.D. Power said, though the industry's average transaction price is up 2.2 percent to a record $34,292. J.D. Power says average discounts this month have dropped $663 on cars but climbed $42 on light trucks. Automakers are scheduled to release December and full-year sales results on Jan. 3. The industry will count transactions closed Jan. 3, 2018, through Jan. 2, 2019, toward 2018 volume. Analysts -- yes, the same ones who predicted that 2018 would be a down year -- say mounting headwinds will probably prevent the industry from reaching 17 million units in 2019. "Even though 2018 is ending stronger than expected, there are a lot of reasons to approach 2019 with caution," Jeremy Acevedo, Edmunds' manager of industry analysis, said in a statement. "Automakers continue to rely heavily on upping fleet sales to mask eroding retail demand, and that's not a sustainable place to be. 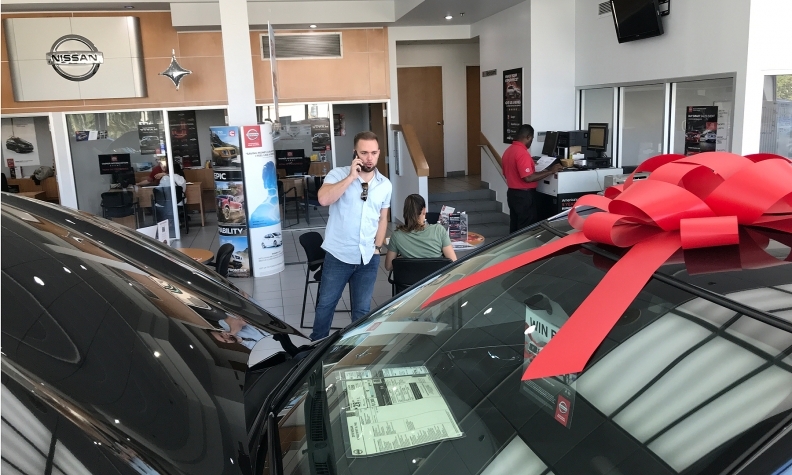 A record number of lessees returning to the market should help give dealers a boost in the new year, but rising interest rates and vehicle costs are going to continue to give car shoppers pause and create uncertainty in the market." Cox and Edmunds said they expect FCA US to achieve a double-digit sales gain in December, the best among major automakers, and that Hyundai-Kia also will post an increase. General Motors, Ford Motor Co., Toyota Motor North America, American Honda Automobile Division, Nissan Group and Volkswagen Group of America are all projected to report single-digit declines in volume and lower market share. Corporate tax reform passed by Congress in late 2017 had a positive effect on commercial vehicle sales in 2018, Cox Automotive analysts say, as companies used extra cash to upgrade car and light-truck fleets. Cox Automotive said commercial fleet shipments were strong throughout 2018, and estimates rental fleet volume rose by over 100,000 units versus 2017. The market has also been helped by lower gasoline prices, which have helped fuel light-truck demand and offset weak car sales. J.D. Power notes that more than 45 new or redesigned light vehicles are expected to be launched in 2019, including 28 pickups, SUVs and crossovers.